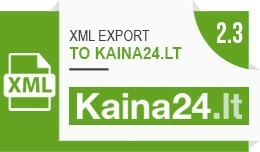 OpenCart XMl prekių eksportas į kaina24.lt el.parduotuvę Prekių eksportas į kaina24.lt el. parduotuvę. XML atitinka visus reikalavimus ir pritaikytas pagal naujausią parduotuvės specifikaciją. 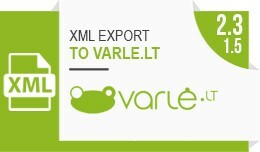 Instaliavimo metu neperrašomas nei vie..
XML prekių eksportas į kaina24.lt / XML export..
LT: OpenCart 2 prekių eksportas į varle.lt el.parduotuvę Prekių eksportas į varle.lt el. parduotuvę. XML atitinka visus reikalavimus ir pritaikytas pagal naujausią parduotuvės specifikaciją. 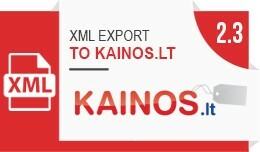 Instaliavimo metu neperrašomas nei viena..
XML prekių eksportas į varle.lt / Product XML ..
LT: OpenCart 2 prekių eksportas į kainos.lt el.parduotuvę Neoficialus prekių eksportas į kainos.lt el. parduotuvę. XML atitinka visus reikalavimus ir pritaikytas pagal naujausią parduotuvės specifikaciją. 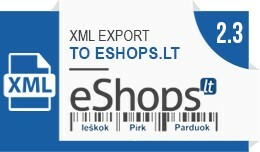 Instaliavimo metu neperraš..
XML prekių eksportas į kainos.lt / XML export ..
LT: OpenCart 2 prekių eksportas į eshops.lt el.parduotuvę Neoficialus prekių eksportas į eshops.lt el. parduotuvę. XML atitinka visus reikalavimus ir pritaikytas pagal naujausią parduotuvės specifikaciją. Instaliavimo metu neperraš..
XML prekių eksportas į eShops.lt / XML export .. 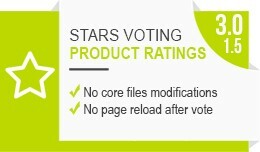 Replace default product rating stars with AJAX based live voting system. Just click on star icon and your vote will be accepted. You can set: Vote unlimited times or only once Vote only for logged users or for all Vote with ap.. Product stars ratings (OCMod / VQMod / jQuery ..
Add extra HTML to product page tabs or options as pop-up window. 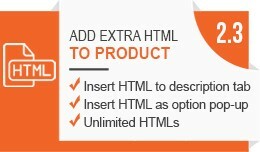 ✔ Insert unlimited HTML as product tab ✔ Insert unlimited HTML as product option pop-up ✔ Ideal for you size table ✔ Suitable for multilanguage ✔ No core files m.. Extra TABs / HTML text in product page (Size tab.. 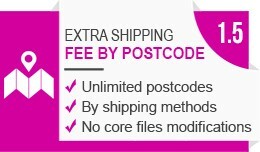 Extra shipping fee by postcode ✔ Set extra fee value by postcode ✔ Settings by customer group ✔ Settings by shipping method Add extra fee to order total based on client shipping address postcode. This extensions is useful when ship.. 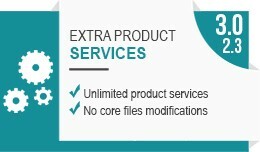 Extra product services allow you add unlimited extra services to your products such as extended warranty, insurance, carrying services and something else. 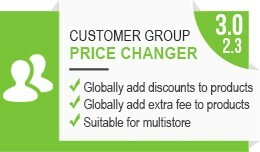 It is similar to products options, but the biggest difference that extra services in your .. 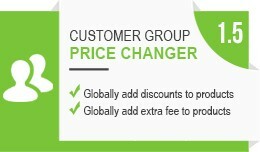 Extra product services (extended warranty, insur..
Globally change Customer group prices ✔ Increase prices by fixed value ✔ Increase prices by % value ✔ Decrease prices by fixed value ✔ Decrease prices by % value You don't need to change prices for each product. This module .. 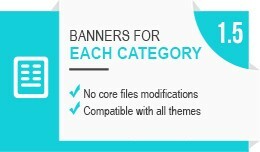 The opportunity to choose in which categories or home page to display banners. Just edit your banners and choose categories you want. 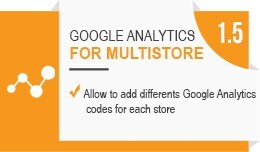 No core files modifications (only one vQmod file) Easy to install Compatible with all themes DE..
Google analytics for multistore It allows you to use different analytics codes for each your store. You just need to set-up codes for each code in you Google Analytics and copy-paste to each store. - - - - - - - - - - - - - - - - - - - - - -..